I'm in! I'll be coming down with Jesters. Can't wait to see you all! What a weekend! Food, fishing, fun, and friends. As a newbie, I felt welcomed and can’t wait to get together again. The conditions were less than ideal, but we still caught some fish. I was blessed to get to fish both Duane and Phill. I leaned a lot from both. The food was amazing. Thanks to all the guys who cooked. Duane worked his magic with the fish and the deer nachos. Those flavor crystals were on point. The Martyque that Les made was amazing and Johns mushrooms were great. Let’s not even talk about the smoked chili and kraut and sausage in Thursday. Fishimg on the lake was good buy a bit slow. For me , it was the night that was awesome. Dj, Geno, Daryk, John, and I all wandered up and braved the dark and cold. The fishing was good, I daughter several nice bows. The highlight was a story I will never forget if Daryk would not have been there I don’t think any one would have believed it. At about 11 Dj and Duane’s lute were slammed by a big fish. After 10 minutes or so, we finally got a glimpse of the biggest brown he had ever hooked up on. He did a fantastic job of bringing him in, then disaster struck. I was trying to net it for him and the the fish came off. Dj dropped to his knees and grabbed for the tail. He was not able to keep the hold and did not get a picture. We were both beyond upset. He stood for a while dejected and I went back to fishing. After about 5 minutes, I was slammed and it was on! My little ultralight bent over and the drag screamed. After around 10 minutes we were able to land it! A beautiful brown and she was HUGE!! Measured 32’ and 11” tall. It was the same fish DJ had hooked up on. She even had a 12” rainbow sticking out of her mouth. We were able to get pictures for both of us, and we are having a mount made. She was released and swam off strong. I was upset that we had to move it cause I’ve always wanted to fish the White, but this experience couldn’t be beat! Thank you very much Phill, for the hospitality. I’ve got to post as well! After Dj caught an enormous fish and I failed to net it for him I felt horrible!! He has a beautiful fish and no pics! Then... BAM!! Fish on!!! He hit one of Duane’s rainbow patterns and bent my rod over. The line peeled and my drag squealed! Dj was yelling for me to beach him instead of the net! Finally got him to shore! He was 32” long and 11” tall! He had a 12” rainbow hanging out of his mouth! It was perfect. What are the odds?? For what is worth, and I am not a local. . . .Watching weather.com shows Saturday being the worst day. Temps during the day look to remain above freezing. My main concern is the water status. I have never fished the legendary White, so I am really excited. But as I am riding with HKJesters, I will go where he takes me. As long as he is taking me fishing! Quillback, i am a newbie this year. What can I bring to help out food wise. My wife is a good cook and I am pretty good on a Blackstone. It was a slow but fun night fishing. 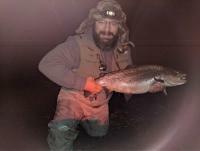 The water was off most of the night and we were able to do some fly fishing at Rebar. Today it looks like rain, maybe that will fuel some better fishing. Man, I am so jealous brother! Those are some great fish. Wish I was there with you! Tight lines my friend. Good morning fellow anglers! I will be taking a trip to my favorite fishing hole this weekend. Can anyone give me a report on how things are on Taneycomo? We will mostly be wade fishing just below the dam. We will be doing alot of night fishing, but I will probably fish most of the weekend. Sleep can wait till monday! Bassfisher, Would you use floats with teh powerballs? i have never fished them. Wily, You are so right, they do grow up fast. I am so excited for this trip. It will be our first father sons trip to go trout fishing. Memories to last a lifetime! Thanks for the advice. No, we didn't get out there. Wish we would have though. I spent the winter fishing Taney. I was considering just using a normal bobber for them, would this work? I thought that it would be easier to cast and see.